I would say the priestess does not know the paladin but the paladin would know who the priestess is. There are not hundreds of priestesses roaming about the temple. While there are priests as well as priestesses of Evelyn, the priestesses hold a special place in the hierarchy as they are more direct conduits of the martyr's divine blessing. So, while the paladin does not know the priestess, she (the paladin) certainly knows of her(the priestess). Last edited by tomplum; 01-22-2018 at 07:51 PM. Cool idea you have here. Good to know. By the way, my RP sample has (finally) been added. I opted not to do the bonus RP after all. All the versions I wrote seemed awkward and redundant. I just couldn't get a fully internal monologue/running commentary to sound natural. I updated my application, sorry that it took me so long. Last edited by cookieyummy; 01-24-2018 at 05:25 PM. No problem! Thanks for the application. For those with completed applications, I'll start rolling out feedback over the next couple of days. I always strive to do the right thing, in every situation...as long as there is little risk, or discomfort. It would probably be better if I just donated money. I am loyal to my family. I know that, in their eyes, I am a disappointment. I always tell myself that I will make them proud but fate seems to say otherwise. I am a good man. I may be indulgent and some would say even petulant, but I am a good man. If you think otherwise, just wait... I'll prove you wrong! As I said earlier, I am my family's biggest disappointment. I offer no excuses, except to say that growing up the only son of a disinterested noble father certainly did not engrain discipline and respect into my character. We have all suffered as a result. Appearance: Bretton does not stand out in a crowd. He does not command attention nor does he particularly care to. Bretton stand approximately 5'8 and weighs, on a good day, 175lbs. He wears his dark brown hair cut short as he does not want to be bothered keeping it styled in some peacock manner. Bretton does not need the finer things in life, but lets be honest. Poor quality clothing is itchy and ill fitting, so Bretton likes his clothing a bit on the finer side, with a dash of color, preferably forest green and sky blue. Bretton likes to bandy about with his two longswords, gifts from his mother at his sides. He has named them Fate and Destiny and carries them in jet black scabbards. Personality: Bretton is a good natured boy from a noble family that never really had time for him. As a result Bretton never learned the value of hard work and discipline. Bretton has become the king of the dilettantes. He has dabbled in this...dabbled in that...and mastered nothing. His family did try to steer him right but the only skill he did acquire is the ability to make excuses and blame others. Backstory: Bretton Gildon has led a charmed life. The only son of a prominent noble family he has wanted for nothing. Bretton has experienced no tragic deaths in his young life. No monsters have invaded his keeps and because of this Bretton has been free to follow his interests where they lead him. The Gilden family has been known for generations as the finest of upscale cutlery manufacturers, but a future dealing in forks and knives just did not excite young Bretton. However, the possibility of shooting lightning from your fingers, or turning rats into cats...now that was something Bretton could get into! And so he did, studying under his family's house wizard, Noelle. Bretton seemed to have somewhat of a knack for the wizardly arts. But as Bretton was wont to do, he lost interest. Bretton just moved on, claiming that all the reading was causing him to have migraines. This pattern repeated itself for years until Bretton was forced to undergo weapons training with the house guard. Bretton did not enjoy the training, not at all. But he was good at it. In fact, he was very good. What Bretton found out about himself in the midst of this training was a simple fact. Bretton did not like to be hit. And the only way to stop from getting hit was to get faster...get smoother in his movements...to concentrate! 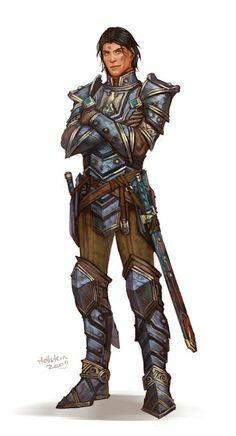 RP Sample: Bretton slowly peeled off his armor after another long hard day standing at attention. It had only been 2 months since he had finished his entry level training and yet he was already contemplating leaving the Temple of Evelyn. "Why should I put up with this nonsense?" He thought to himself. His father had greased enough palms to ensure that Bretton would make it through the training and land a plum position as a temple guard. "But no one asked me what I wanted did they?" Bretton looked around the bare military barracks at the other members of his company. They hated him. Bretton was sure of that, but he did not exactly understand why. Was it his fault he came from richer stock? Bretton turned to the soldier next to him, a young fellow by the name of Kieran who was just finishing putting away his squared away uniform and boots. So, Kyron, what did you think about today's assignment?" "Pretty boring if you ask me!" They might as well make us statues!" The soldier turned and glared at Bretton. Through gritted teeth he replied My...name...is...Kieran." "It's the same name I have had for the past two months." Kieran sat down on his bunk, looked at Bretton and shook his head. You just really don't get it do you? "Kieran muttered as he laid down and turned his back to Bretton. Bretton could feel his face turning red, whether from embarrassment or anger he could not tell. "I'm sorry...It must be the heat...I..." Bretton stammered, before realizing that it did not even matter. He did not belong here. His fellow soldiers knew it and so did he. Bretton quickly extinguished the candle overlooking his bunk and laid down. With new found determination he vowed "Before tomorrow comes, I will be gone!" Last edited by Begon Ugo; 01-24-2018 at 10:32 PM. Some feedback done in order of application submittals. If you don't see one for your character yet, don't worry, I just haven't gotten that far. Trait: When I set my mind to something, I follow through no matter what gets in my way. Bond: It is my duty to watch over and protect the more civilized areas from afar. Ideal: Evil comes to all ages; we must stand ready to fight against it. Flaw: Definitely not a people person. I'm uncomfortable talking to strangers. Appearance: While tall for a halfling, most others are far taller. Sandy brown hair, hazel eyes that seem harder than most halflings'. Woodsman gear, and a whittling kit tucked into his belt. Personality: Quiet and withdrawn, Berry is nonetheless a fierce and loyal protector of those in his charge. He has a hard time relating to anyone, though deep inside he longs for companionship, even friendship. The one strong relationship he can claim is with his adoptive father, who continues to encourage him to seek others out. Backstory: Berilac ("Berry") lived with his parents near the woods at the edge of the forest. When the town was attacked by orcs, Berry's family was killed, and he gravely wounded. He was rescued and nursed to health by a ranger, but when the ranger Delwin attempted to return the young boy to the town, nobody wanted to accept the boy. "His family was attacked first," the less-polite muttered, "so they must've done something to bring the orcs down upon us!" Thus, Berry grew up in the forest, training under the tutelage of his adoptive father. While physically near the halfling lands, his upbringing away from people, combined with his deep pain and bitterness at the town's reaction, kept him far from the people he protected, emotionally. He eventually came to terms, with the help of his "father" with the town's reaction, realizing that guilt and superstition was mostly to blame, but never regained any sense of kinship with them. RP Sample: "Help us!" screamed the farmer's wife, clinging to her wounded, bleeding husband. A small child clung to her skirts, screeching in fear as orcs rampaged around them, largely ignoring the pitiful family as they set torch to the barn and house, laughing roughly and searching for valuables even as the flames caught. An orc, watching the others while he caught his breath...or perhaps simply grew bored, leered at the woman, "No-one will help you," sneered the orc in a gutteral voice. "Nobody will save..." As he spoke, a sharp whistle pierced the forest air, ending with a meaty-sounding *thunk*. The orc stiffened, then fell over, an arrow projecting from the back of its skull. As the other orcs stopped, looking around in confusion, another pair of arrows flew from the dense underbrush of the surrounding forest, claiming another pair of orcs. "GO FIND WHO THAT IS!" bellowed one of the larger orcs, cuffing a nearby subordinate to get the group moving. Six orcs sprinted into the forest, disappearing into the foliage with crashing and cursing. For several minutes, both orcs and humans waited, listening tensely. The orcs were quite audible with their movements, but every so often, a strangled cry, or pained scream, would be heard. The orc leader's expression was a perfect storm of anger and growing fear as the crashing subsided a little more with each scream. When it seemed there might be only one orc left, the crashing became louder, as if the orc were returning quickly. Before he reappeared, however, the crashing suddenly became silent. "This forest holds only death for you," a voice said in Orcish, though the voice clearly was not that of an orc. Higher in pitch, and clearer, it seemed ill-suited for the rough language it spoke. The orc leader sneered, and eyed the farmers balefully, considering an attack upon them, or perhaps using them as hostages. As the orc hesitated, another arrow flew, this time ringing off the sword of the leader, causing him to yelp and drop it. "Last warning," the voice floated back from the trees. It was enough. The leader growled a command, snatching up his sword and following the remaining orcs back down the trail from whence they'd come. Once they'd cleared out, the farmer's wife began weeping in relief and gratitude. "I know who you are," she called out, searching the forest with her eyes. "You're that halfling, the ranger they say watches these woods! Thank you, thank you so much!" The woman waited, listening and searching, hoping to catch sight of their savior. She glanced down as her husband groaned and stirred, then looked back up, seeing nothing. She heard nothing but silence. Bonus RP: Berry looked down from the hill upon the down of Coedtref. After several days' travel, he'd finally arrived, though the city was hardly a welcome sight to the halfing's eyes. Get a good look, he told himself with a sigh, it's the last time you'll be looking downward toward anyone for quite some time. Deciding there was little sense in delaying the inevitable, he trotted forward again, toward the last of his journey...or rather, toward the beginning. I've never seen Delwin so agitated before, he thought as he moved. He could face any manner of beast or foe without so much as a quickened pulse, but he almost seemed...fearful. Berry had not been happy about Delwin's insistence that he meet some stranger at an inn in the city. Cities were crowded. Inns were crowded. I don't like crowds, Berry reminded himself needlessly. Nevertheless, the matter must be important to upset Delwin so. Berry would thoughtlessly lay down his life for the old man, so traveling to an inn should be little matter. Though that could very well be what I'm actually doing, he smirked grimly. The guards stared curiously as Berry passed by, though he paid them little mind. Dodging effortlessly among the feet of various travelers, townfolk, and beasts, he scanned the landmarks and occasional street sign in his search for the inn, based on Delwin's directions. Finally arriving at the spot, he avoided directly approaching the inn, choosing instead to inspect the wares of several merchants set up across the street while surreptitiously watching the inn for signs of danger or ambush. He sighed as a gnome merchant fussed at him for idling instead of shopping, probably assuming the halfling to be a thief. Scowling, he shoved a silver coin into the merchant's hands and waved off any change, just to shut him up. Across the street, no sign of danger presented itself. Patrons came and went, and nobody (except for Berry himself) seemed to be watching the inn. I hope you know what you're doing, Delwin, he thought, and moved into the street, tossing the vase he'd bought (and unknowingly paid triple for) aside. The merchant, after a brief curse, suddenly grinned, and collected the vase for resale, watching the ranger as he made his way across to the inn. Last edited by Andor; 01-26-2018 at 05:27 PM. Last edited by tomplum; 01-26-2018 at 08:16 AM. Just as an fyi for anyone still considering an application. I've bumped the closing date one week to February 2nd. Thanks for the review, I have updated my app.